Fall has come to PA. It took its sweet time getting here but finally most of the leaves are down, the ferns have died back, and even the Dahlias have surrendered to frost. As I rummaged beneath some oak leaves, cutting back stems of Monarda and Echinops, I found a fungus I hadn't seen before. I'm a beginning mycophile, still only sure of a handful of edible fungi, so this was a good i.d. challenge. After looking in 4 different field guides and taking a spore print (white) I decided this was Laccaria laccata (common laccaria). Friend and teacher Gary Lincoff graciously confirmed my i.d. It's not supposed to be delicious, although it is edible. But I have a strong desire to know what my yard tastes like, so this morning I scrambled them in eggs, with the last tomatoes and basil from the garden. True, the taste didn't knock my socks off, but it was nice and shroomy, and the gentle texture was perfect for eggs. Maybe later there'll be time to take a walk in search of other, more robustly delicious mushrooms. 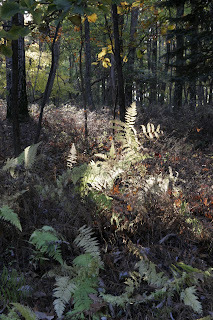 The woods are irresistible this time of year: cool temps, no bugs, and the fragrance of hay-scented ferns sweetens the air. And since we could get snow any day...we'd better hunt mushrooms while the sun shines. Lovely--both the shrooms and the forest view. I keep walking between clients through Central Park hoping for more mushrooms, but struck out this past week.